Does anyone else feel as though each year brings a greater quantity of great children’s books as the previous year? 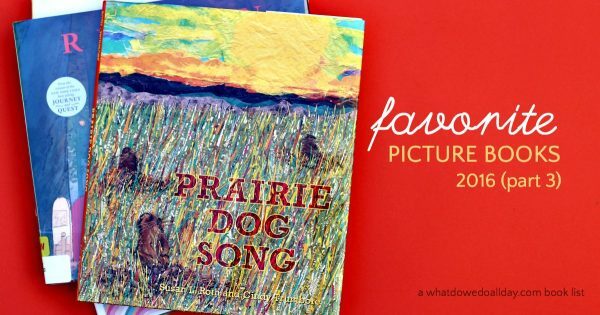 I sometimes think I can’t make these lists of our favorite picture books fast enough. And certainly I could put so many more books on them, that the titles I do choose seem rather arbitrary. 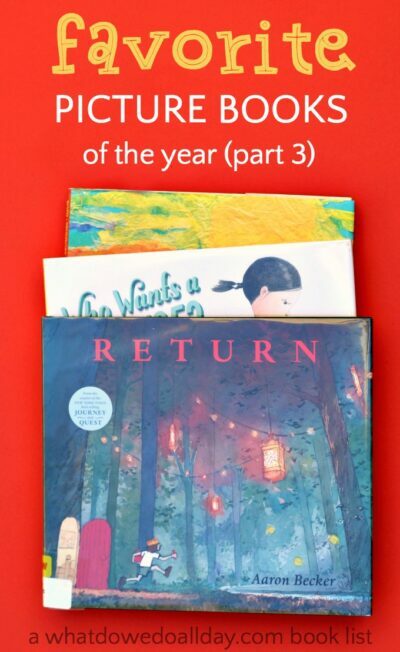 The picture books on this list, however, are the ones that I remember my kids either commenting on again and again, or laughing at, or prompting insightful comments. Return by Aaron Becker. This is the third book in the gorgeous wordless trilogy. Both Journey and Quest were on previous favorite books lists. Return is the splendid ending in which we discover the secret backstory of the magic crayons. The Storyteller by Evan Turk. My seven year old was captivated by this original folktale set in drought-stricken Morocco. A boy in search of water hears a storyteller recount wonderful tale about a djinn. He comes back the next day to here the next layer of the story. Evan Turk nestles stories within stories in a captivating tale and the luxurious illustrations will enthrall your kids. The All Saw A Cat by Brendan Wenzel. The concept here is simple, everyone sees the same object—a cat—in a different light. But the delivery and illustrations are fantastic. This book is sure to spark great conversations about how our perspective colors our views and opinions. Who Wants a Tortoise by Dave Keane is a cute book about a girl who really wants a puppy, but her parents get her a tortoise. Parents will see immediately that of course by the end of the book the lovable, spunky girl will come around to love her unique pet. The course of events which lead to this conclusion is utterly charming. Prairie Dog Song: The Key to Saving North America’s Grasslands by Susan L Roth and Cindy Trumbore. This is an absolutely gorgeous collection of poetry. Each poem is a verse of an adaptation of the song “And the Green Grass Grew All Around.” My kids may not have enjoyed my singing as much as I did—I happen to love that tune so I was particularly delighted. Each double page spread also includes informative text about the history of the prairie and its ecological importance. Roth’s mixed media collages parallel the depth of the prairie’s life. Thunder Boy Jr. by Sherman Alexie is both fun and thought-provoking. Thunder Boy, Jr. wishes he had a normal name, like his sister. And he does not like being called “Little Thunder,” which sounds “like a burp or a fart.” He sets out to pick a new name, perhaps one that reflects one of his great achievements. In the end, he settles on a the perfect name—one that is both his very own and still connects him to his dad. Let’s Play! by Hervé Tullet is the latest interactive book from French author-illustrator extraordinaire. The text asks kids to perform certain actions which then result in a playful journey, including a bit of an emotional ride. The Sword in the Stove by Frank W. Dormer is a hilarious story about the mysterious appearance of objects in the stove. Antics and punchlines follow as they try to discover if the culprit is Eenie, Meenie or Harold. Great fun. More-igami by Dori Kleber. This is a sweet story of perseverance. After his classmate’s mother teaches him origami, Joey is determined to be a master folder. But it takes lots of practice! He finds the perfect place to hone his skills at the local restaurant. My son loved watching Joey fold household items, especially the money! One Day in the Eucalyptus, Eucalyptus Tree by Daniel Bernstrom. My son and I adored the rhythmic text of this book. A snake lies in wait for it’s next meal, gobbling up creatures as they cross his path. Little does he know that his meals and snacks are planning their escape from his stomach! Lots of fun and great for all ages. The Pros and Cons of Being a Frog by Sue deGennaro. This is a sweet book about friendship. Two very different children are friends. Camille loves numbers, the narrator loves dressing up. Camille suggests that her friend dress up like a frog, which turns out to be such a success that the narrator decides to make a costume for her friend. Things go a little haywire, but in the end the two learn how important their friendship is. Are you new here? Please check out the index of all my children’s book lists! Many here that I haven’t heard of yet, and many that I’ve heard of but am still waiting for at the library…grrrrrr.